Day trip with brother Francis to Anilao, scuba destination of our (and our parents’) youth. 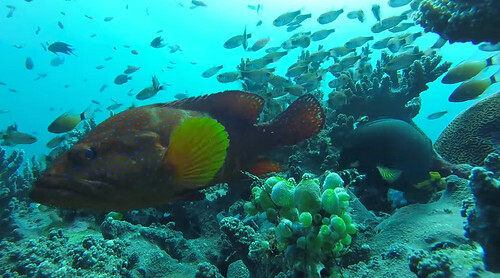 We dove out of Planet Dive, a resort in Anilao equipped for day trips, right off Twin Rocks, a relatively shallow and easy marine sanctuary accessible from the resort via shore entry. Shore entry means you literally walk into the sea, wearing full gear, then start swimming when it’s deep enough. Lots of scary looking sea urchins nestled in the rocks, though the dive center seems to have done a good job of keeping the immediate shore entry area urchin-free. 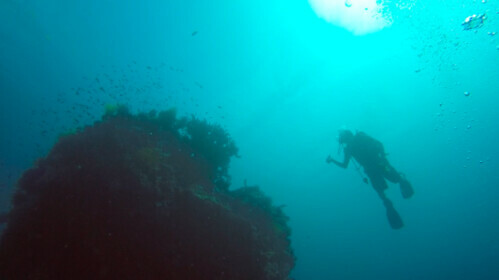 On descent from the entry point is a sunken barge which serves as anchor for the dive buoy. The Twin Rocks themselves are several meters north of this spot, a leisurely swim over scattered clusters of coral, harboring schools of fish and other diverse sea life. 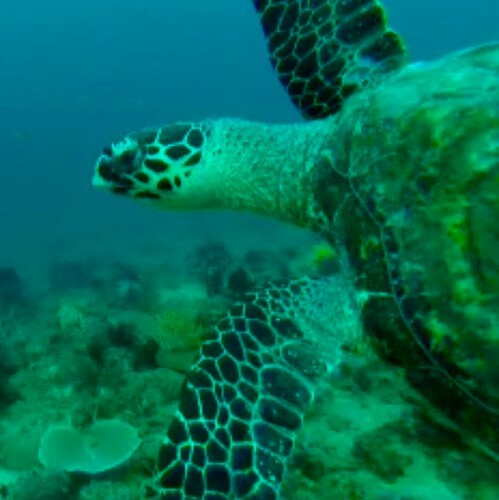 We met a friendly turtle and a shy mantis shrimp. Hour long dive, with nice shallow reef area for safety deco stop en route back to entry point. Lots of fish and coral but again, many urchins in the shallows. Second dive after lunch. Went a bit deeper after shore entry, going past the sunken barge down to 80 feet. Sea floor was barer, with only scattered clusters of coral dotting the sand. 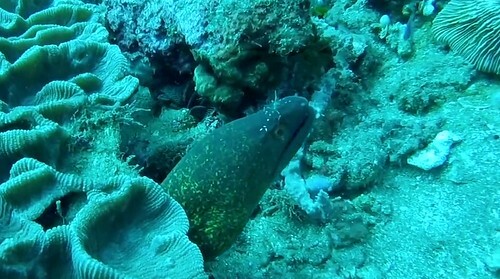 Saw a moray eel peeking out from under some coral, with a cleaner shrimp roaming around its head and ducking in and out of its mouth. Up at the Rocks I tried leaving my GoPro alone on the coral for a few minutes, so that fish normally fleeing my presence returned to the reef, schooling around the camera unconcerned. Got a good silhouetted scuba self-portrait, and an inquisitive red snapper came close to the camera three times, possibly trying to intimidate the GoPro away from its reef. Overall, a nice pair of dives, and the resort day trip package included lunch and decent dive shop service. Extremely grateful to my brother for taking time out of his day for the trip.